Nice site! Thanks Carlos and Donna and friends! Those totals are amazing! Thank you for creating the charts for all of us to share and enjoy. 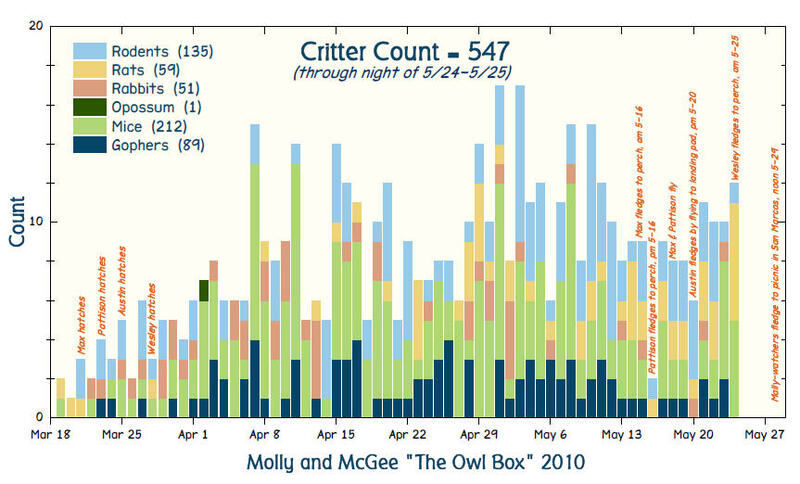 We’re definitely thinking about an owl box after seeing the tallies! These charts are amazing! Maybe a chart for when they leave the box and guesses on when they will fledge? 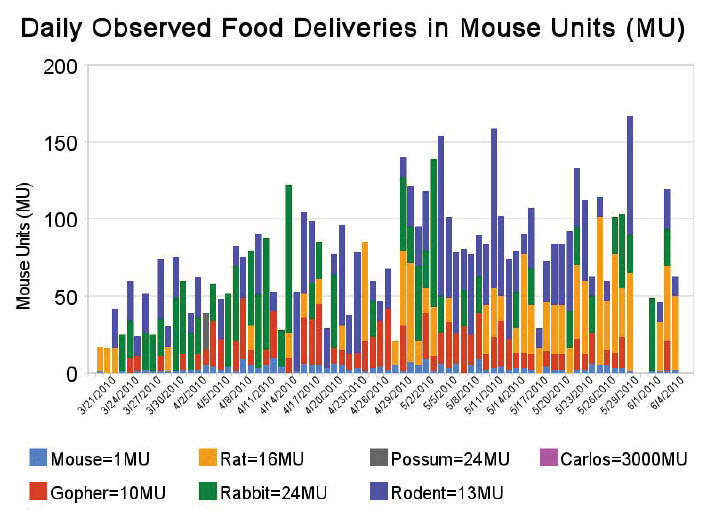 Charts, photos, and all the cameras have created a spectacular living science project. Austin should get some high marks at school for his contributions. 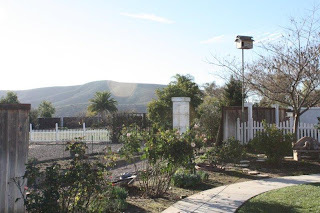 Donna and Carlos have created a wonderful place to watch, observe, and learn. The owls give us daily lessons about how to treat each other. Being a wildlife biologist….I can really appreciate an accurate and detailed website when I see one. These charts are great! Thanks so much for sharing your owls with the world. Thanks so much – this is so interesting!!! These are amazing stats! 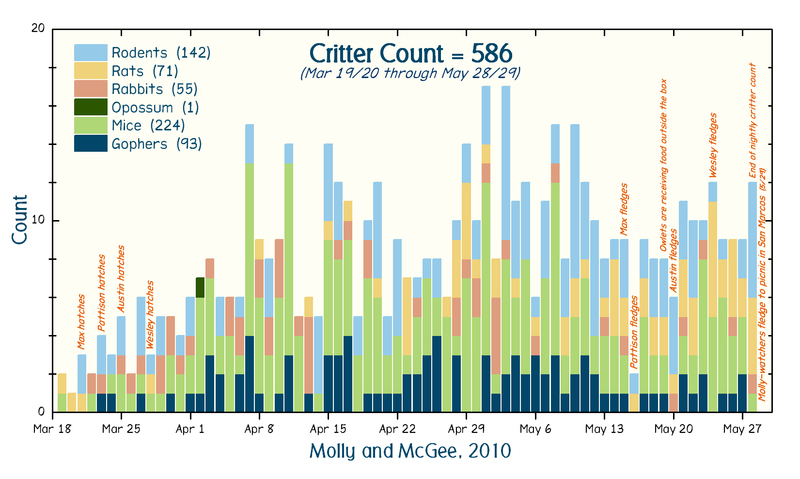 I hope this can be used for future research by those who study bird behavior. Thanks! Carlos & Donna, you and your work with the owls has been a true blessing. Thank you for all you efforts ! The Royal’s deserve an Audubon Society award! Won’t it be interesting to see who uses these charts? It is great for the visual learner. 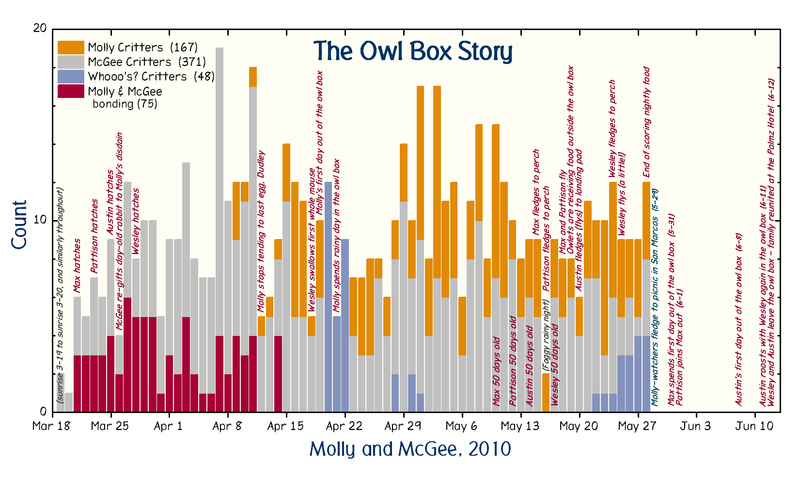 I think it will also be great for the scientist to have all this data compiled on one owl family. Congrats to you for this wonderful work! 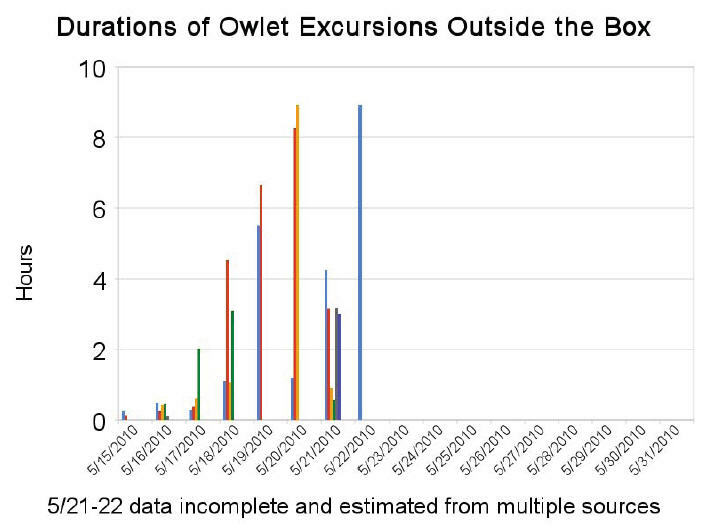 I’ve been wondering whether it’s coincidence that the owlets’ first outing time each night is at about the same time every night. It’s probably related to the amount of light or the angle of light (length of shadows, or percentage of ultraviolet in the light …) or the mix of wavelengths in the light (the color of the sunlight). 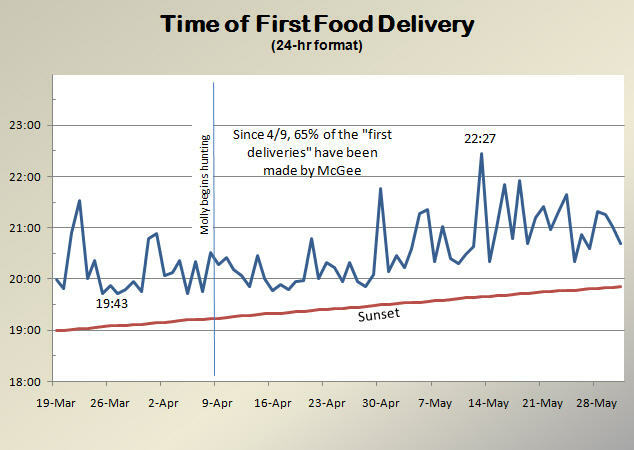 We don’t have a lot of data, but isn’t it about the same time, regardless of degree of overcast? Hint hint I’m hoping the chartmasters add outing times to the data …. though it would take some special data to figure out which environmental factor is most closely correlated. Sorry for the punditry. This must be why people stay away from me at parties! 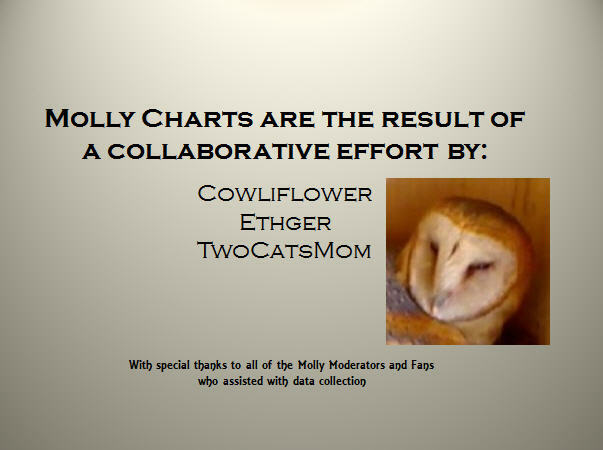 Thank you Cowliflower, Ethger, and TwoCatsMom for these fantastic charts. Thanks to Carlos, Donna, and Austin and the Royal Family as well as the moderators and Molly Fans who made all of this possible. What an experience! THANK YOU FOR ALLOWING SO MANY TO VIEW SO MUCH. 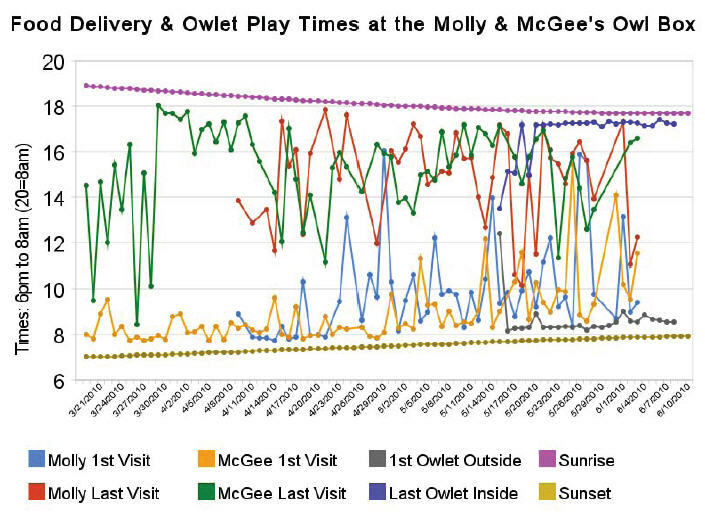 The food charting alone makes me want an owl box…a Molly & McGee pair could do wonders for cutting down the rabbits and rodents who scurry across my property at night! I’ve been getting into your charts big time. Thank you!! These charts are fantastic! Would love to see them updated through the end of this wonderful adventure, including the days each baby stopped roosting in the box. Such a wonderful source of data! Thanks to everyone for your comments and encouragement! WOW!! great stuff here and a lot of hard work! Carlos = 3000 MU. LOL! the other information is fascinating, but that first bit really cracked me up. One of the best things about this whole venture has been the wacky humor. Much thanks to all the observors and chaarters! That must have been from the Vacadude cartoon strip #17 where Mcgee was trying to lift Carlos and said it would keep the kids fed for a week! LOL! Didn’t see that until you pointed it out Sarah! Thanks! Too funny! These charts are just great! Are any of our owletts starring in the “Legend of the Guardians”? I think is due out in the fall and is in 3D. Thank you for sharing the Owls. 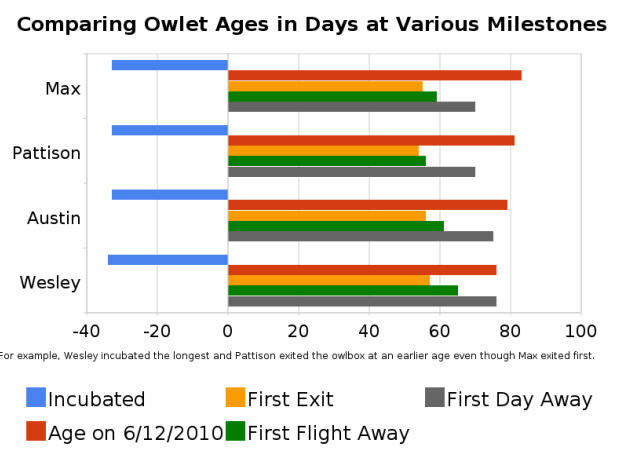 Had to laugh at Wesley’s green line indicating First Flight Away – she really did NOT want to leave that owl box! If it weren’t for Austin coaxing her out, Molly & McGee would have had to chase her out so they could have their second clutch! Many laughs with Wes. Amazing record keeping everyone involved. Impressive!!!! Thank you. I just want to thank you for all the work you folks have done in bring us the great story about Molly & Mc Gee and family. I just found these charts and think they are amazing! Great effort, fun results! Thanks all! Please keep us posted on updates. Thank-you very much. Printed everything out so I can keep it with my “Molly the Owl” book which I received yesterday. Thanks to everyone for giving us this wonderful experience. Memories will never fade and will be keep in the heart forever! Loved every minute of the first & second clutch.